Samosa is an Indian deep-fried appetizer with spiced potatoes. This is an easy samosa recipe with step-by-step method on how to fold Samosa, plus the tips to making the best Samosa filling. Samosa is an amazing and mouthwatering Indian appetizer made with a spiced potatoes filling. It’s a popular street food in India, sold by street vendors. The filling is wrapped using Samosa wrappers into triangle cone shapes. They are then deep-fried to golden perfection. I love samosa and always have them at Indian buffets. I would load them up by the bunch and sink my teeth into the crispy goodness. They are so good! The filling is made of potatoes, green peas, onions and spices. The best filling has the perfect balance of flavor and texture. The potatoes shouldn’t be too mushy or chunky. It should be aromatic with the spices used, however the filling shouldn’t be too spicy. Traditional samosa dough is made with maida flour, which is a type of flour available in India. You can use all-purpose flour as a substitute. 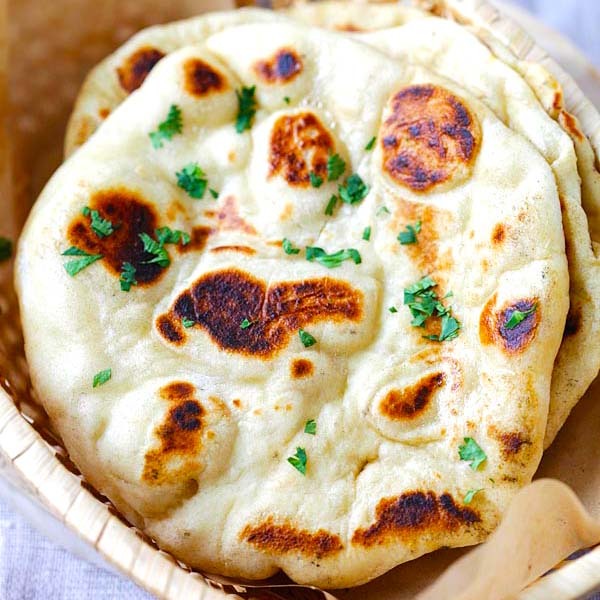 Other ingredients of the dough include butter, salt, water and carom seeds or ajwain. I usually use frozen spring roll wrappers to save time. After deep-frying, you get the crispiest Samosas. 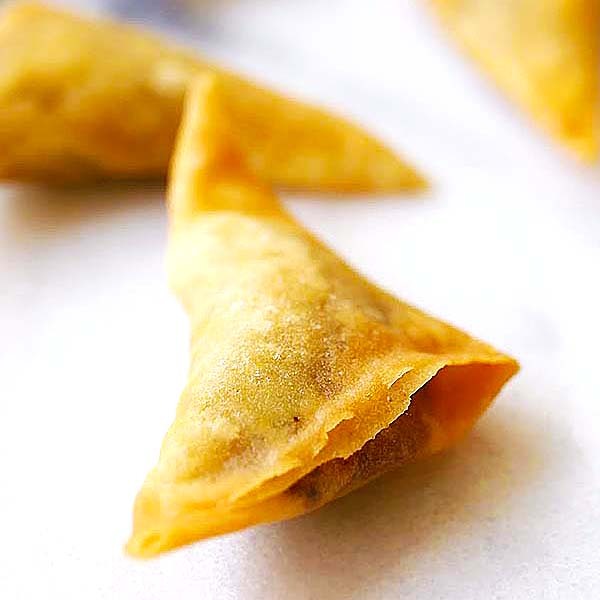 To fold a Samosa into a triangle shape using spring roll wrappers, you want to start by scooping a teaspoon of the filling and place it at the top center part of a piece of wrapper. Brush the outer edges of the wrapper with egg white, fold and form the shape into a triangle. Pinch the edges and all corners to make sure it’s sealed tight and there is no leakage. 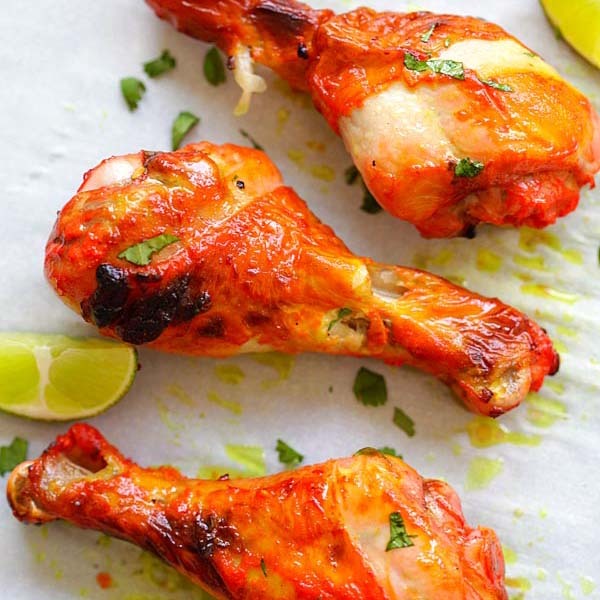 They are usually served with a healthy dipping sauce (green chutney) made of cilantro, mint, garlic, jalapeno, yogurt and lime juice. For me, I love eating them as a plain appetizer without any dipping sauce. They are delicious without the extra calories. 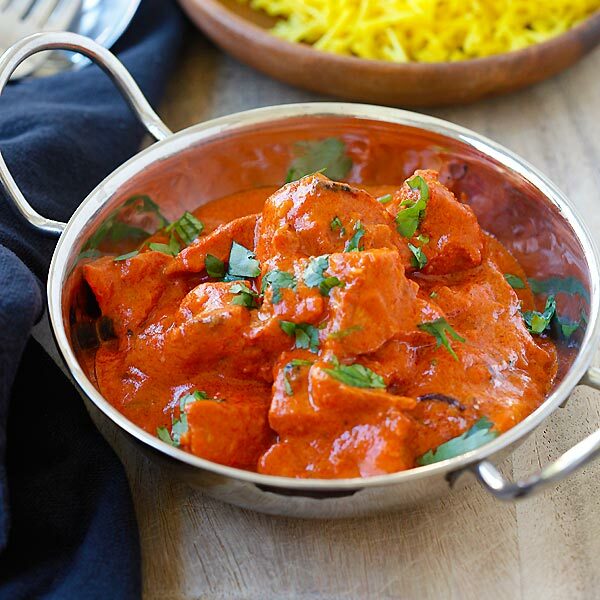 For a wholesome Indian-style dinner at home, make the following dishes. Boil the potatoes for 10 minutes or until they are completely cooked through. Drained and let cool. Peel off the potato skin and break and mash the potatoes using the back of a spoon. Heat up a skillet and add the oil. Saute the onion until aromatic before adding he potatoes and green peas, curry powder, chili powder, sugar, and salt. Cook for a a few minutes. Remove from the skillet and let cool. Scoop 1 heaping teaspoon of the filling and place at the top center part of a piece of wrapper. Brush the outer edges of the wrapper with the egg white, fold and form the Samosa into a triangle. Pinch the edges and all corners to make sure they are sealed tight and there is no leakage. Repeat the same until the filling is used up. Deep fry the samosa at 350°F until golden brown. Remove from the oil using a strainer or slotted spoon, and transfer to a plate lined with paper towels. Serve warm. This recipe is from my e-cookbook Easy Asian Takeout. Looks good! Do you buy the small square spring roll wrapper for this or the large one?